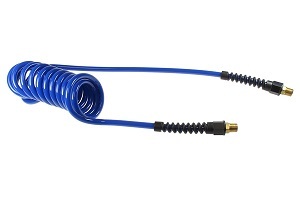 We offer a variety of permanently-coiled hoses from Coilhose Pneumatics. Our range of coiled air hoses include lightweight to heavy-duty nylon and we offer a variety of fittings and repair kits. Our line of coiled hoses includes the well-known Flexcoil polyurethane hose and the highly regarded FLEXEEL inner-braided polyurethane hose. We also carry such popular brands as Stowaway and Slimcoil nylon hoses. N0412 - SLIMCOIL Nylon Air Hose - 1/4"-in.